Optional password protection allows only designated users to access the security settings and locking options. System must contain a c-wire. 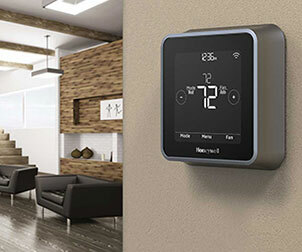 The Honeywell Second Generation RTH9585WF1004 Wi-Fi Smart Color Thermostat is designed to fit the individual. The creation of a custom schedule will satisfy comfort needs while optimizing energy savings. Smart Response Learning eliminates the guessing work out of programming by allowing the Wi-Fi Smart Color Thermostat to learn preferred heating and cooling cycle times. This feature ensures the correct temperature right when it's required. The inclusion of a customizable color touchscreen display will invite owners to create their own unique look when matching their home's surrounding decor. 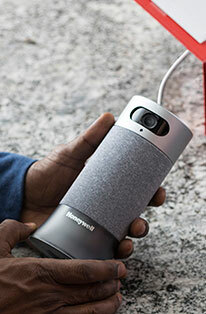 The Honeywell Total Connect Comfort App provides immediate and convenient access via smartphone, tablet or computer. This level of access and customization ensures the ultimate in peace of mind as owners will have complete control regardless of setting. Intelligent Alerts add even more layers of versatility by informing homeowners when air filters and humidifier pads require changing. The Honeywell RTH9585WF1004 Wi-Fi Smart Color Programmable Thermostat offers the best of both worlds in performance and versatility by utilizing Amazon Alexa and a selection of Smart/Intelligent Features. Product Size (WxDxH): 4.5 x 0.8 x 3.5 in. Partially locked: Only temperature can be changed. Fully locked: No access allowed. I had gotten a thermostat like this one from Walmart to use at another location, but needed to use somewhere else. I liked it, so I ordered it from Honeywell. The same. I am very pleased with the unit. Before you purchase a wifi thermostat, go to the app store and investigate the app you'll use to interface with it. I initially had purchased another brand wifi thermostat because it was a bit less expensive. We installed 6 of those in our church to allow us to remotely modify schedules for special events. That was a big mistake. The app isn't stable and locks up. We have since moved those 6 to other locations that seldom change, and installed the Honeywell in the original locations. The Honeywell app is very stable, easier to use, and allows us to switch between heat, cool or auto changeover from the app. The other didn't have these abilities. The thermostat has great functionality and seems to control better than the other as well. The installation instructions are great. We have 7 of them installed now and haven't found any issues with them. Ability to change color of thermostat is an awesome feature. Easy to install. I did have a problem determining system type. Given 3 options - forced air, heat pump, hot water or steam. I selected heat pump and it should have been forced air. I do have a heat pump but system inside the house is forced air. Took me a day to figure that out! Installed exactly one month ago along with new heat pump and love it. I don't even require my glasses to see and set it. Beautiful functionality including outdoor temp and humidity, and setting temperature when were coming home from I phone. Great looking and you can select different background colors. I bought an Ecobee 3 for our bedroom zone last week. The first one wouldn�t work, spent an hour on hold for technical service, I gave up and returned to the store. It turns out the contacts had released from the board. I exchanged for another Ecobee 3. Instructions were non-existent. Set up very difficult, I spent 3 hours trying to set up. I spent another hour on hold again with no answer . I'm an electronics technician with 26 years experience. A week later I purchased I purchased the Honeywell for our living room zone. I had it installed, on the network, and working in 15 minutes on the first try, I can't speak about their customer service as I never had to speak with them! You decide, LOL! 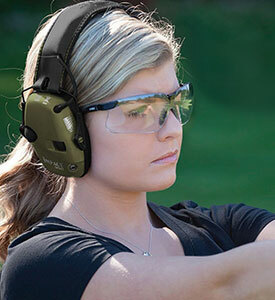 We have been considering a few different brand and model options. 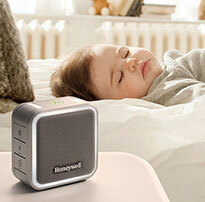 We had been satisfied with our older model Honeywell and decided to stay with the Honeywell brand. The upgrade to the smart unit has been a wise decision. We could not be happier. Installed easy. Love the WIFI option and fan recirculate option. Ability to change color to match the decor is nice also. Thermostat is very accurate. Honeywell makes a quality product.